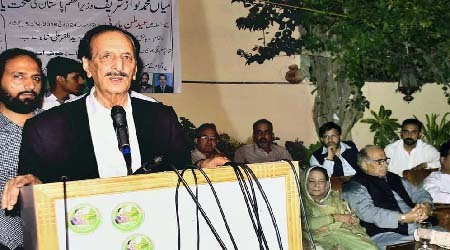 ISLAMABAD, Oct 20 (APP): Chairman Pakistan Muslim League (N) and member Senate Standing Committee for Kashmir Affairs Raja Zafarul Haq Thursday said after recent tyranny in Indian Occupied Kashmir, there was a growing feeling in the international community to stop India from committing further atrocities. Talking to APP, he said even in India, except Indian ruling Bharatiya Janata Party (BJP), other political parties were criticizing policy of the government in IHK and had rejected the violence against people. Indian Prime Minister, Narendra Modi was under pressure and did not find acceptance of his stance against Pakistan during BRICS meeting, he added. He said India increased its atrocities in Occupied Kashmir after martyrdom of Burhan Wani. Chairman PML (N) said Kashmiris were deprived of eyesight with firing of pellet guns, women were being dishonored and human rights violations were on the rise in Occupied Kashmir. should be stopped from oppressing Kashmiris in Occupied Kashmir, he added. of Islamic Cooperation (OIC) a strong resolution was adopted against the human rights violations in Indian Occupied Kashmir. mission for looking into human rights violations by Indian army. be given their right to self-determination according to United Nations General Assembly resolutions, he noted. being implemented speedily, adding implementation of the policy was being reviewed in internal meetings. The minister said Prime Minister Muhammad Nawaz Sharif was continuing to send parliamentary delegations to important countries to draw world attention about the recent situation in Occupied Kashmir and to highlight the issue at international level. special envoys had provided documentary evidence of the human rights violations in Indian Occupied Kashmir. right after the Uri attack. However, their viewpoint was not backed by China, Russia and United States and other leading countries, he added.